Plywood and OSB (oriented strand board) structural panels can be used for floors, walls, roofs, doors or any combination of these applications in transportation equipment like dry van trailers, truck bodies, utility trailers and vans. In some cases a conventional panel may be the best choice; in others, a plywood panel overlaid with resin-impregnated fiber, or a panel of plywood overlaid with metal or fiberglass-reinforced plastic (FRP) may perform more satisfactorily. The basic considerations influencing design include vehicle usage (e.g., inner-city delivery vs. long-haul); climate (corrosion resistance of framing materials, reflective roof coloring in warm climate, etc. ); physical environment (rental units, fleet operation, type of loading, etc. ); production facilities; and government regulations for cleanliness and safety, including limits on formaldehyde emissions. APA Rated panels are exempt from U.S. EPA and California formaldehyde regulations due to their very low emission rates. Find more information on formaldehyde. Because of their inherent strength, durability and smoothness, conventional wood structural panels and structural overlaid plywood panels provide excellent lining materials for trucks, trailers, vans and rail cars. Since linings are ordinarily subjected to extremely rough usage, many factors govern material selection. The leading application of plywood and OSB structural panels in buses today is floors, although panels can be used for seat frames. Combined subfloor/underlayment (single-floor) construction provides economy, ease of application, stiffness and resilience. Appropriate grades of plywood touch-sanded or sanded during manufacture offer a smooth surface for direct application of nonstructural finish flooring. 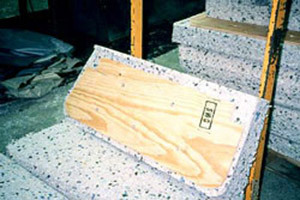 APA RATED STURD-I-FLOOR panels may be used in combined subfloor/underlayment construction. STURD-I-FLOOR is available with either square edges or precisely engineered tongue-and-groove joints that eliminate the need for blocking or other edge support. Panels can be ordered with either Exterior or Exposure 1 durability classification. For applications subject to continuous moisture or high humidity, specify only EXTERIOR panels. 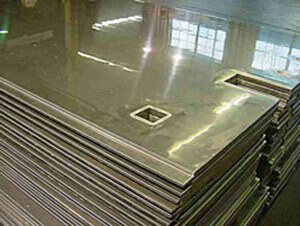 Although some bus manufacturers have successfully used APA A-D or C-D PLUGGED panels, RATED STURD-I-FLOOR panels are recommended because of their more reliable puncture resistance. 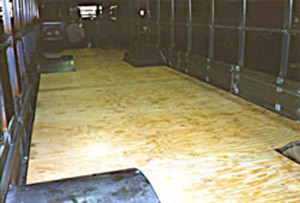 Vehicle floors sometimes can be exposed to a demanding environment. In these instances, excessive moisture may become a problem, especially at panel edges and at fastener penetrations. Untreated wood structural panels, including Marine Grade plywood, might decay if conditions are right for decay organisms to flourish. One solution is to use preservative-treated plywood, especially for floor repairs where decay of untreated panels has occurred. 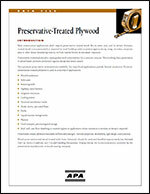 Preservative-treated plywood is impregnated with preservatives by a pressure process. The resulting deep penetration of preservative treatment provides protection against decay. The plywood should be marked APA Series V-600 for Exposure 1 panels, and APA series V-611 for Exterior panels, which signify panels suitable for preservative treatment. The plywood should be treated in accordance with American Wood Protection Association Standard UC2 (Plywood-Preservative Treatment by Pressure Process), and, for waterborne preservatives, redried to 18 percent moisture content or less. The same properties that make plywood and OSB structural panels great for truck and bus applications apply to railroad cabs as well. Plywood is used structurally in the floors of most transit cars. Because it is relatively light in weight, stiff, strong, moisture resistant and easy to shape and adhere to, plywood is laminated on the face and back with sheets of stainless steel and ready to receive finished floor materials. 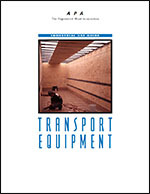 This publication features panel grades and design criteria for truck, trailer, and intermodal container bodies and linings. It also includes information on recreational vehicles and buses. This publication describes specifications, uses and advantages, acceptances, technical data, finishing recommendations and identification of preservative-treated plywood.